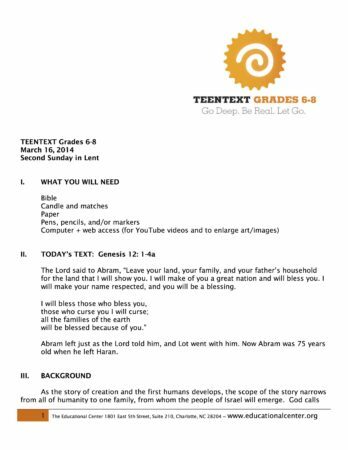 TeenText is a Lectionary-based, digitally-stored Sunday school curriculum, with two age groups, 6th-8th grade and 9th-12th grade. TeenText helps youth connect Scripture with their lives by helping them get out of their heads and into their hearts. There are no “right interpretations” and the format encourages continued exploration and application throughout the week. Each month’s lessons are emailed as a pdf. The individual lessons include a paragraph or so of background about the Scripture for the leader. Leaders should be prepared to spend half an hour or less in preparation. Every lesson starts with a short ritual – lighting a candle, saying a prayer, welcoming all into the conversation. Then the week’s Lectionary-appointed scripture is read and a series of questions (and sometimes activities) are discussed. Questions are open-ended to encourage creativity, as well as to include current events. In addition, lessons all include supplemental materials: movie clips, YouTube videos, classical or contemporary art, music, or poetry which connect contemporary culture with Scripture and everyday lives. Every session ends with a blessing. What’s Great About This Curriculum? As a ministry coordinator, TeenText’s digital format means I can zip out the lesson to a substitute teacher very last minute and everything they need is in the pdf. As a teacher, I love the “Beyond Sundays” questions, which bring students from Sunday through the week. Do they have to answer them? Of course not. But the folks writing TeenText have been working on the concept of being a Christian Monday-Saturday for a long time, even if we church folks are just getting used to the idea. I also appreciate that the “Between Sundays” questions enable leaders to include youth who are not at class on a particular Sunday. Teens, like all Americans, are busy people, and not all of them will make it to Sunday school each week. The “Between Sundays” questions can be sent out to everyone and no one needs to feel as though they have missed a key piece if they miss a week. It takes a few minutes to orient yourself on the Educational Center’s webpage. Bookmark and download samples when appropriate. The publishers assure you that all leaders need is to be good listeners and to open to their own spiritual journey! There is, however, a leader’s guide so that adults have the tools necessary to guide teens through the Bible and connect it to their lives. The leader guide walks you through the weekly set-up and offers helpful hints in working with teens. You can download a sample on the Educational Center’s webpage, under “Our Store” and “Teen Text.” Once you have ordered the curriculum, the entire month of lessons will be sent to via email, every month. You can then forward it to the week’s leader(s). Be sure to note which grade level you are ordering for and check out the samples of each. Educational Center: Resources for the Spiritual Journey is a small non-profit, non-sectarian publishing company, based on the belief that the real issues in life are not about dogma or “right interpretation” of scripture. Since 1945, the Center has been teaching from a student-based perspective, influenced by the writings of Kierkegaard, Jung, Niebuhr, and Buber. All of the Educational Center’s materials are question-based and aim to tell stories: our story and God’s story, and how and where they connect in our current lives.